In a bid to make good on his campaign promise to cut regulation, President Donald Trump has signed executive decrees to roll back key reforms enacted in the wake of the 2007-09 financial crisis. Trump on Friday initiated action to fulfill one of his core electoral pledges: slashing government regulation. As part of this, the new US president has signed two executive orders asking the Treasury and the Labor Departments to look into ways of reforming rules that were designed to make markets safer and give consumers more protection. "Today we are signing core principles for regulating the United States financial system," Trump said in the Oval Office as he signed two executive orders. One order has asked the Treasury Department to identify possible changes to a package of financial reforms - known as Dodd-Frank - enacted in 2010 by President Barack Obama. Among other things, the legislation created the Consumer Financial Protection Bureau (CFPB) and required banks to keep more capital on hand to prevent over-leveraging. Can Europe exploit Trump's protectionism? Earlier this week during a meeting with business owners, Trump described the Wall Street reform law as "a disaster." "(We) believe that Dodd-Frank in many respects was a piece of massive government overreach," said a senior administration official on Friday. "It imposed hundreds of new regulations on financial institutions; it established an enormous amount of work and effort for financial firms," the official added. Republicans have made no secret of their dislike for the CFPB. Any substantial repeal of Dodd-Frank would require congressional action, but with the executive directive, the Trump White House is keen to send a signal that it is ready to slash red tape. Another presidential order takes aim at the so-called fiduciary rule, which legally obliges financial advisors to act in their clients' best interest. The decree imposed a 180-day delay on the implementation of the rule, according to a draft memo seen by Reuters. During that time the US Labor Department is to conduct an economic and legal analysis of the regulation and rescind the rule if it is inconsistent with Trump administration priorities, according to the memo, which is not final. The US Chamber of Commerce and other trade groups are seeking to have the fiduciary rule overturned in court, and a federal judge reviewing the case signaled in a court filing on Thursday that she plans to issue a decision no later than February 10. Democrats and consumer rights groups say the rule is necessary to protect individuals against potential conflicts of interest that brokers may have when guiding them to invest for the future. Complying with the rule could cost firms as much as $31 billion over the next decade, according to Labor Department estimates. The impact of the executive orders remains to be seen. Analysts say Trump could make many changes by appointing new personnel or simply choosing not to enforce rules already enacted. The German lender has started providing files to New York authorities related to funding of Trump projects. Investigators are interested in Deutsche Bank as it is one of the few banks to lend to the Trump Organization. House Democrats have subpoenaed the German lender and several other banks as part of a probe into the US president's finances. The investigation seeks information related to possible Russian money laundering. 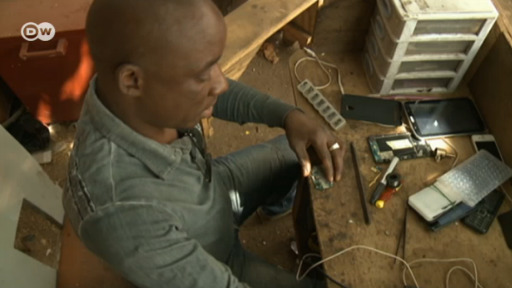 Dealers at the Marché de Telephone in Bamako give old cellphones a new lease of life. One in three foreigners seeking to join a spouse in Germany is unable to do so because they fail to pass a basic language test. FPÖ General Secretary Harald Vilimsky told ORF moderator Armin Wolf that he could face "consequences" in a recent television appearance. Wolf had compared a flyer from an FPÖ youth wing to anti-Semitic Nazi propaganda.